It looks like John Carter and Dejah Thoris are done exploring and are heading home. But they find a different sort of "Homecoming" awaiting for them (and for once I'm giving a SPOILERS warning). In what appears to be the last issue for this series (before the upcoming Dejah Thoris series begins) Ron Marz and Ian Edgington swipe the old "it was all a dream" scenario and just let's it sort of hang there in space. Look I understand it can be easy and a way to provide a twist in the storytelling but here it just doesn't go anywhere and actually left me frustrated that as a reader I endured some so-so issues just for this to be the ultimate revelation. Also it leaves plot holes (like how did Ras Thavas drug John and Dejah, transport them...) and a half-baked finale. Granted it was nice to see Thavas, even if the series seems confused about the timeline established by Edgar Rice Burroughs (Homads were used in a prior issue yet Ras still has his old ancient body, not the younger one he was transferred into in The Master Mind of Mars). I could just be getting too nitpicky but honestly it's just a bum wrap-up. Ariel Menel's artwork helps somewhat but even then there are issues. The facial expressions are bizarre with John and Dejah looking angry at each other, leading me to believe they were going to fight at some point, the backdrops are bland and only the final action sequence delivers. Also did Woola shrink or is it just me? 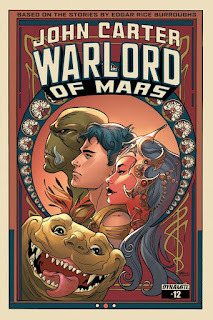 Hopefully this isn't the end of John Carter and Barsoom. Then again giving this series a breather to refresh the creative batteries might help. Just temper expectations and you might enjoy this, otherwise let's wait and see what Dejah Thoris will offer. Until next time folks.